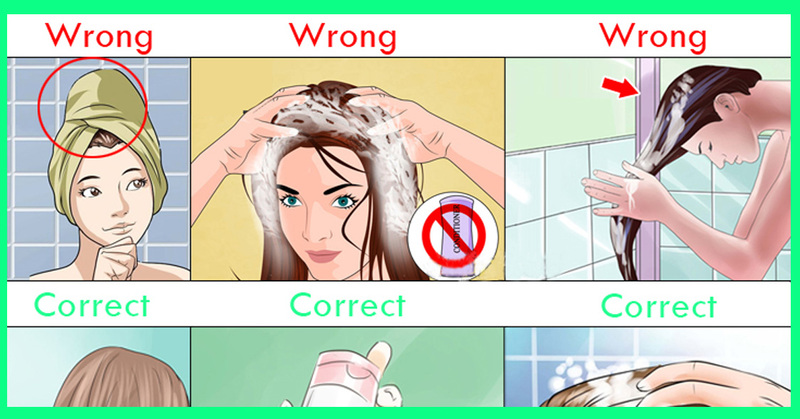 This Is The Right Way To Wash Your Hair, You Were Doing It All Wrong! We all desire to have a good looking, soft and shiny hair, that it does not fall too much and always be in a way that we can style it in a million ways to go with whatever we wear. Advertisements today even cater to this major need. Sadly, not all recommendations and advertisements work, they end up leaving the person disappointed and at a loss higher sometimes as well. We will all wish the world to be a wish granting factory but sadly it isn't and you have to find your own solutions. In this case, you don't even need to find a solution because you can help your hair and in the process yourself by just avoiding some mistakes you normally do. Towel drying isn't the best idea. Thanks to friction, drying your hair using towel can lead to frizziness which can lead to hair damage as well. Instead, you could use other methods such as using a t-shirt or blotting your hair. Too much doesn't mean better. If you think that using a good quantity of shampoo or conditioner is a good idea, believes us it isn't. This isn't some competition where you use more and win, even a bit is good enough. Scrubbing your hair too hard can be one of the leading cause to create problems to your hair as it leads to loss of hair and also makes your hair weaker. You should rather be mild and not ruin your hair. Sometimes in a hurry and sometimes because you don't care, we don't wash our hair properly. Your most important area is the root where most of your problems will be dealt with. Apply your conditioner on the strands to the tip and it will help you moisturizing your hair. Shampoo isn't the correct choice. Advertisements show that shampoos should be used to make your hair soft? No. They essentially in the long run damage your hair more than the benefit they give you for a short term. Being chemical in nature, they can make your hair dry and ultimately lead to loss of hair from the scalp. Surely you wouldn't want that. You could skip it and use water and make your hair healthier, because hey it's growing for you. The rinse-and-repeat technique isn't always the best. Doing a second round strips your hair from the moisture it has. Do this only if the need is high otherwise you're creating a problem for yourself. Hot shower is a big NO NO. After you've had a really long day, maybe at school, college, with friends or at work or anywhere you tend to get tired and at that moment we want to have a hot shower, massage and a good sleep. Sounds good doesn't it? Not really. Hot shower damages your hair. You should instead replace the hot water with lukewarm water. After you use conditioner, people don't let it settle and they wash it. You need to time yourself. Also, detangle your strands when you have conditioner and see the smoothness like you've never before. You shouldn't condition wet hair. Most people usually condition their hair just after they wash it not realizing the fact that they aren't supposed to condition dripping wet hair because in this case, it doesn't affect they way it should. Calm down for a few seconds and close the water and at the end use some cold water to wash your hair with. Trust me, you aren't looking for comfort.